More Americans would choose to consume media via models that provide access for free with a few long-form ads, but free ad-supported media with many short-form ads would be their next preference, according to a survey of 400 U.S. adults conducted Tuesday by Research Intelligencer and Pollfish. After entirely free, ad-supported models, more Americans would prefer to pay a higher premium fee with no ads than those willing to subscribe for a more moderate fee with some forms of advertising, including one single sponsorship. The survey was fielded in response to a variety of industry efforts to test new shorter form ad formats, including six-second commercials. 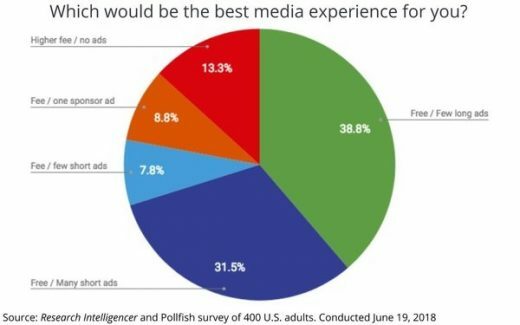 While those models are being tested ostensibly because they create a better media experience for consumers, this week’s survey indicates most Americans still prefer a few longer ads (see related story).